· Multiple layers of foam allows faster sink in. · Backrest height 50 or 60 cm. · Breathable 3D or wipeable Easy Care cover. · 17 cm side support. 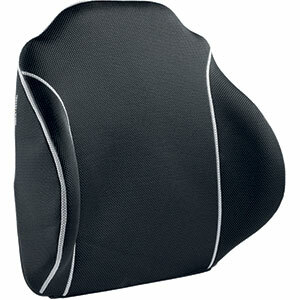 · Ergonomically designed and carefully placed lumbar support for greater upper body stability. · Plenty of room for the hips to ensure a stable sitting position. · The unique design ensures freedom of movement of the shoulders. · Freedom of movement of the arms due to low side supports. If you already have a 50 cm cushion, it is enough to buy a 60 cm cover and a backrest extension. This makes the handover of the chair to new users easy and economic. Netti | Smart, Netti | Stabil und Netti | Super Stabil are supplied with a 60 cm high backrest. There is a measurement system with six crescents at the back of the backrest. This ensures that the cushion can be re-placed correctly and easily by a helper when the cushion was removed to be washed, for example. Two rear flaps with velcro that hold the pillow so it does not change its position. This makes the chair look chic also from behind. Integrated storage bag The lower flap can be folded down to cover the gap between the back and seat cushions.